So much of what makes a city memorable is entirely situational. Where you stay, who you're with, the people you meet, the weather, the previous night's sleep... they all affect how you perceive and react to a new city. That being said, this list is where I personally enjoyed my time during my 6 months exploring Europe. I was in Ireland during some of the best weather they’ve had in the last ten to twelve years and I was definitely going to take advantage of it. Doolin is an extremely small town situated on the Cliffs of Moher on the west coast of Ireland. The nearest grocery store is a half hour walk up hill out of the city and when you get there you realize it’s just a glorified petrol station convenience store. None of that really matters though. The town is situated on a trail system that gives you some of the best views I experienced all trip. I woke up at 6am my second day there and, along with one of the other hostel guests, we walked along the cliffs at sunrise. There wasn’t another soul out there for two hours. What made this one of my favorite locations was the charm of just how small the town was, the ease of getting to some of the best hiking I’ve ever seen, the friendliness of the hostel staff and guests and the ability to see the Cliffs of Moher in a way you never get if you do it by tour bus. Favorite memory? Sitting on the edge of the cliffs on a gorgeous morning for about a half hour watching the waves crash a few hundred feet below me. The only thing negative about this was the fact that I didn’t book more nights there. Llanberis is one of several base areas for hiking and climbing around Snowdonia peak in Northern Wales. I hadn’t heard anything about this area until I was in Llandudno and I met a guy at the hostel who had just come from Llanberis. He showed me some of the photos from his hike and I immediately booked two nights at the YHA in Llanberis. The hiking is absolutely amazing. It’s some of the most intense hiking I’ve experienced in my entire life. I chose to take the more difficult route that summits Crib Goch in addition to Snowdonia. The hike between Crib Goch and Snowdonia was ridiculous. The views were amazing but the 300+ foot drops on either side of a few foot wide ridge were nerve-wracking. If you’re looking for some great hiking with some great views, definitely check out Snowdonia. Llanberis is the largest town in the area but there are a few hostels scattered around the peak. I liked staying in Llanberis since there were plenty of pubs, restaurants and markets. Favorite memory? Being completely scared but amazed at the views while hiking the ridge between Crib Goch and Snowdonia peaks. 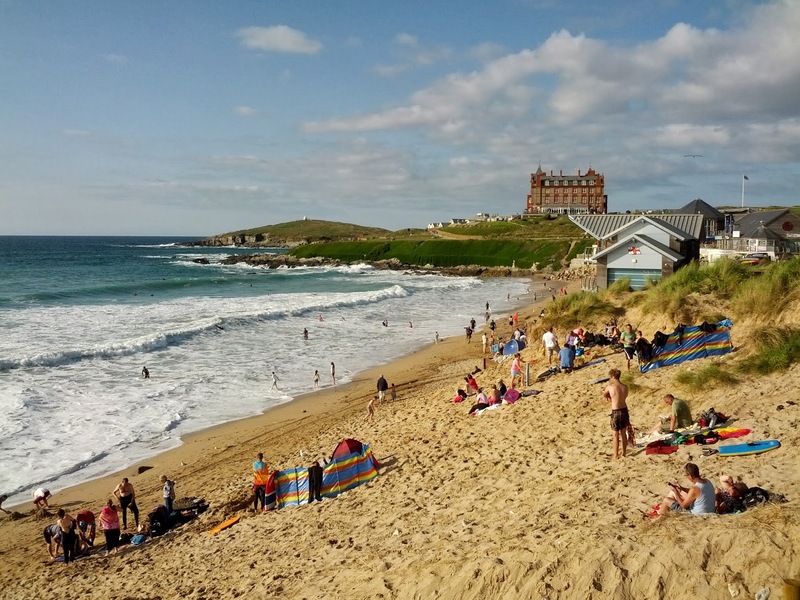 I stumbled upon Newquay almost by accident. I was in Cardiff, Wales for the previous ten nights and was looking for somewhere nearby to head to next on my trip. After searching around some travel websites I found a few articles talking about the "surfing capital of the UK." It sounded interesting and was pretty easy to get to by public transport so I booked a bed and set off. 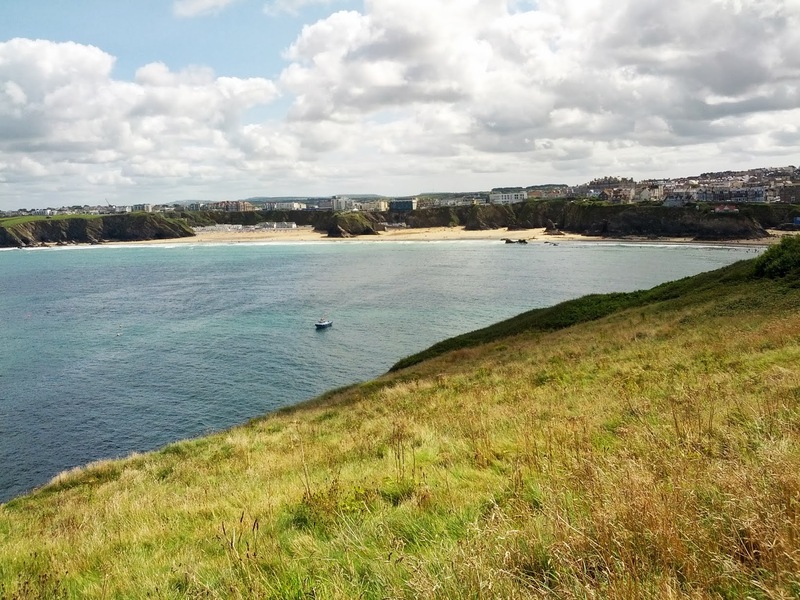 Newquay is down in Cornwall county which is the farthest south west you can get in England. They’re known for some really starch and fat intense meals called Cornish Pasties which are like calzones stuffed with potatoes, meat and gravy sauce. While you definitely wouldn’t want to eat them all the time, they’re pretty good to try. The coastline is also amazing. Tidal swings throughout the day mean sometimes the beaches can be miles long, or you’re stuck in a 12 foot strip with hundreds of other people. These tidal swings have eroded the coastline to form some great cliffs and well as some great surfing opportunities. I did a lot of running along the cliffs and chilling on the beach with other people from the hostel. The place I stayed at was more of a long term surfer’s hangout but they also let random backpackers sleep there too. During the entire trip, I don’t think I had more solid group of cool people to hang out with than I did here. We all cooked out several nights, went to the beach together almost every day, everyone hung out in the dining room and partied together. Favorite memory? Setting up our small gazebo on some sand dunes overlooking the beach and relaxing there through sunset. It rained most of the time and was a lot colder than I’d been dealing with the last couple months but the charm associated with Bruges was unbeatable. Sure, the buildings in Bruges aren’t really that old but it was the first place on this trip that truly felt what I pictured small European cities to be like. It wasn’t overly crowded and all the side streets and small bridges crossing canals made for some great photos. If you love beer and frites, Bruges is also a great place to visit. My hostel, the Snuffel Backpacker Hostel, had one of the best bars in town. Locals even flocked to the hostel at night to drink the huge variety of Belgian beers they had at their disposal. If you’re staying there for a couple nights, get the punch card. They let you try 5 different Belgian beers and you end up saving a few euros overall. In addition to some really nice old looking buildings and small streets that are great to get lost in, there are four still standing windmills that are situated along the outer canal. I was fortunate enough to see them in both the rain (literally got poured on when I was there one day) and also in the shining sun. They’re definitely neat and from the top of the hills you can get some good views of the city. Favorite memory? Going out the first night after it finished raining and having the entire town to myself. I was able to walk around and see some of the best views of the city without any other people trying to crowd the photo spots. The Cinque Terre was my first experience with the Italian Riviera. I got off the train in Riomaggiore and after walking through a huge tunnel to get to the town center I was amazed at the colors and feel of the town. I checked into the hostel and was blown away with the views from the balcony attached to the unit. Another amazing thing I did while staying here was to hike between the towns. Unfortunately the trail between Riomaggiore and Manarola (the next town) was closed. I took a train to Manarola and started a crazy hike up to Corniglia via Volastra. The hike took me through vineyards and olive farms. The views of the coast and surrounding area couldn’t have been better. At night, pretty much everyone who isn’t a local leaves the towns and you’re able to walk around and have the entire town to yourself. I went down to the port several times and took some night photos and enjoyed the peace and quiet that only comes to small places like this. Favorite memory? Hiking in the vineyards between Manarola and Corniglia and having dramatic views of the mountains to the right, the ocean to the left and the Cinque Terre towns spread out in front and behind me. 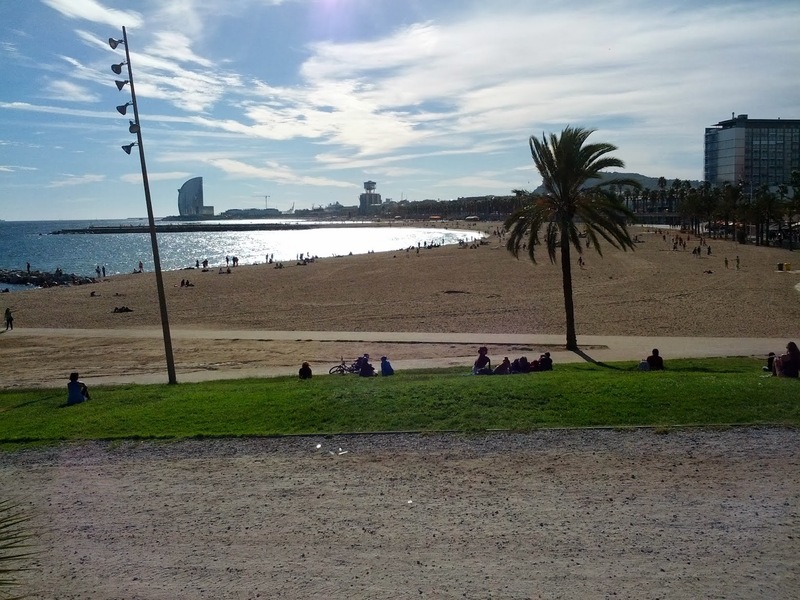 In my effort to chase the sun and keep moving south as the seasons wore on, I found myself in Barcelona. When I first arrived at the end of October it was hitting 80 degrees and was fully sunny. It really brought out the best of Barcelona since it’s such an outdoor oriented place. I had fun exploring the old part of the city, the markets, the beach and many of the gardens. I met and hung out with some really nice people who were also staying long term at the hostel. For Halloween the hostel also threw a party with free drinks and snacks. They had a good book exchange and were in a good location with pretty easy access to most of the sights. Barcelona was my first taste of Spain and I loved it. The food, the drinks, the way of life… they were all so different from every other place I’d been so far. It was one of the first places on the trip where I felt like I could go and hang out there for a few months and still find new things to do. Favorite memory? 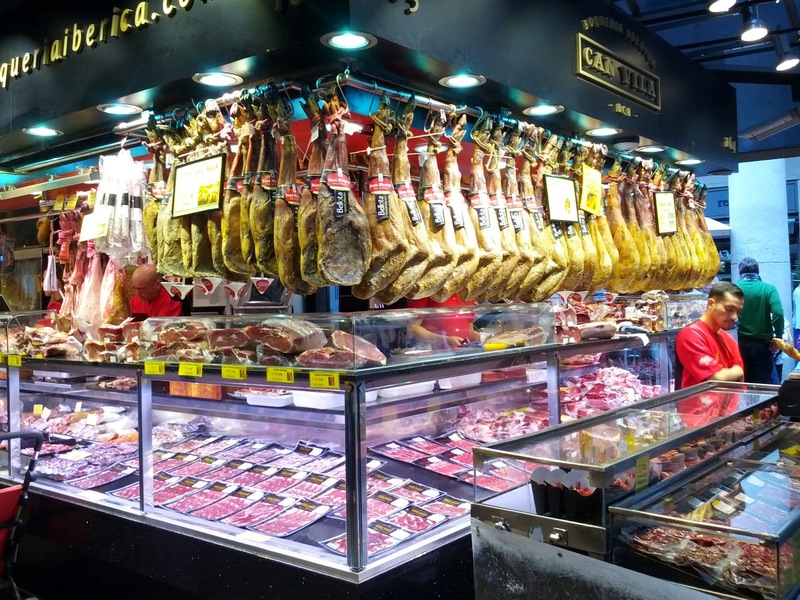 The first time I walked into La Boqueria (the giant market off La Rambla) I was blown away with all of the fresh fruit, vegetables, cured meats and tapas that were on display. I went back several times during my stay in Barcelona to buy fresh food. Cordoba is another small city with a lot to offer. I was in Cordoba in early December and the entire city was decked out for the holidays. All of the lights and the holiday decorations really gave the city a different kind of charm. The city was never really too busy and the people who were out all seemed like locals. It wasn’t an obnoxious town filled with tourists. Being in Cordoba for 6 nights really let me explore the city and get to know it. I was also fortunate enough to have good hostel roommates who wanted to go out for tapas and drinks pretty much every night. It helped ease the sense of loneliness when you’re out with other people in such a social country as Spain is. Most of the places here also gave free tapas with all of your drinks too which was really cool. The Mezquita with its red and white striped arches and Muslim origins were extremely beautiful to see. I went in the early morning when it was free and less busy. I was able to walk around and get some amazing shots without a lot of crowds. The bell tower in the courtyard is also a very impressive sight. Favorite memory? Taking a nature hike with one of the staff at the hostel. We went into some of the mountains outside the city and ended up at a hermitage where we had some lunch and home made Spanish tortilla. I was curious how much my 6 months in Europe cost me so I totaled up all my expenses (that I was diligently keeping track of at clearcheckbook.com) and came up with some interesting stats. I was in Europe for a total of 173 days (June 27 - December 17, 2013). I visited thirteen different countries, some of which cost more than others, but to make this easier I'm not going to break this down by country but instead give overall averages. The total for my time in Europe, including flights to and from, was $11,508.40. Not too bad! If you take the flights to and from Europe out of the equation it drops the total down to $10,803.45 which is just under $63 per day. This includes lodging, travel, food, drinks and sightseeing. When I was first planning this trip I was estimating about $75/day at the high end and I came in below that which is pretty impressive. I cooked at the hostels very regularly which helped cut the costs down. I felt like I was traveling pretty normally. I wasn't super cheap with everything but I wasn't paying to go into every church, castle and museum in every city I visited. I stayed at a few hotels and did a couple overnight buses and trains but the majority of my nights were spent in hostels. If you're planning on a long term trip in Europe, you can definitely get the above costs down if you need to. In Spain and Germany, car sharing is a huge thing. There are several websites that hook up travelers with drivers and the costs are usually cheaper than buses or trains. Couchsurfing is also a way to cut down lodging costs. While staying at hostels is nice for the solo traveler, if you're traveling with someone else finding apartments or cheap hotel rooms can sometimes be cheaper than hostels. The things that most helped me cut my costs down were cooking my own food and staying at hostels. If you can't deal with hostels and need to stay in hotels regularly, plan on spending about 2-3x each night (assuming you're a solo traveler). Also, take advantage of hostel breakfasts. If you're shameless and cheap you can make a sandwich or two with the free breakfast food and eat that for lunch. Notes: A lot of my daily purchases were made with cash. I didn't actually track every cash purchase but I did record the ATM withdrawals which are included in the grand totals above. Also, I used some airline miles to buy my return flight. That return flight only cost me $54 in taxes.